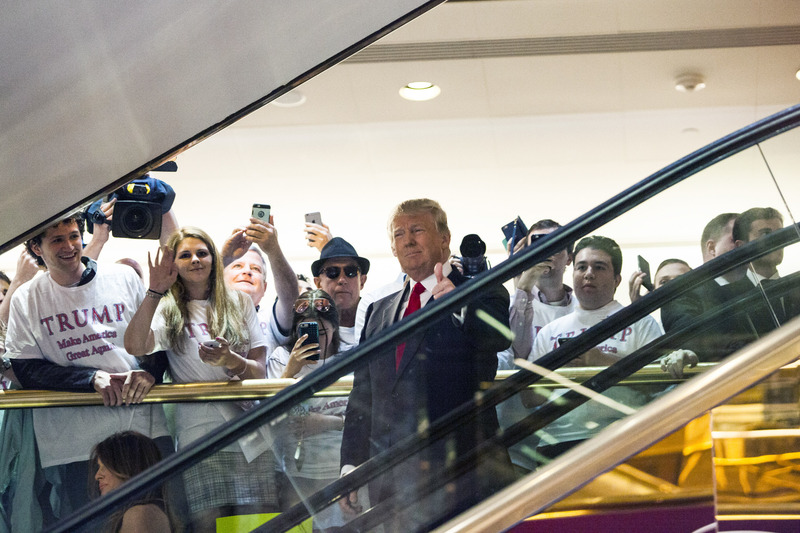 The Internet has been overtaken by a vine of Donald Trump riding down an escalator to his presidential campaign announcement. Trump made his announcement Tuesday morning in the lobby of Trump Tower in New York City, starting his run with a bang and proving that America is in for a presidential campaign the likes of which they've never seen before. From the unintentionally humorous entrance to the seemingly unscripted stream-of-consciousness announcement speech, it seems unlikely that Trump will abide by typical campaign behavior. Hopefully, this is only the first of many "stately" entrances awaiting us on the Trump campaign. Now that Trump is officially on the stump, we can only pray for similarly impressive modes of transportation. Maybe Trump and his staffers will pull up to the Republican primary debate on Segways. Perhaps he'll mimic Hillary's Scooby van cross-country road trip and go on a Vespa tour through the heartland. I would personally like to see a photo-op where Trump visits America's schools and takes a spin around a gymnasium on one of those square scooters. Later, he'll make his rounds in New Hampshire while being carried on a litter held up by the 99 percent. Or maybe, if we're really lucky, he'll decide to make the escalator entrance a staple of his campaign and carry around one of those moving walkways that you find in airports (though not with LaGuardia's help, since the airport is a third world country, according to Trump). As you could imagine, everyone just about lost their minds in excitement over the escalator entrance. Twitter was delighted by the opportunity to make fun of the new candidate. In fact, it appears that the only person who was not enthused by the now famous escalator ride is musician Neil Young, whose song "Rockin' In The Free World" was heard blaring in the background of the Vine. The rock anthem was one of many that Trump used during his announcement speech and is sort of an ironic choice considering it was written to condemn George H. W. Bush's administration and the condition of poverty within the states. In a statement to Mother Jones regarding Trump's music choice, Neil Young's manager Elliot Roberts said, "Donald Trump's use of 'Rockin' in the Free World' was not authorized. Mr. Young is a longtime supporter of Bernie Sanders." Sorry, Trump. You can't win them all.